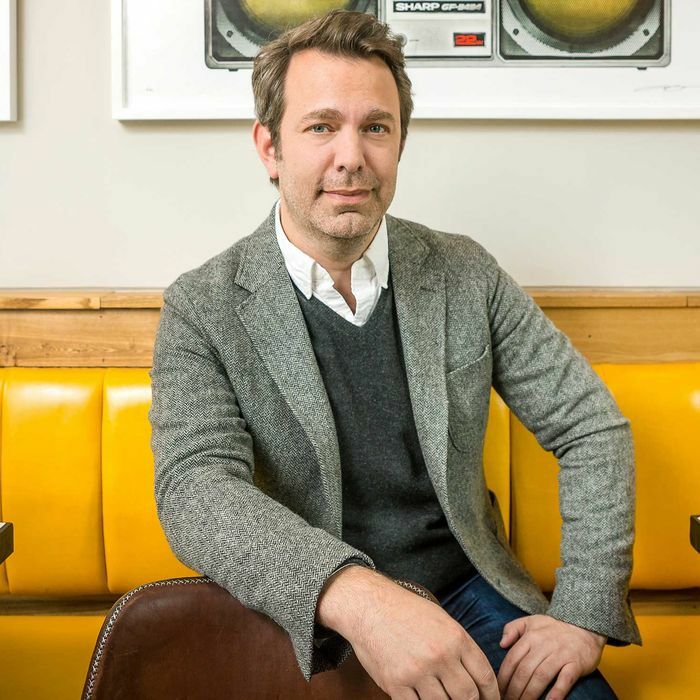 Adam Sachs recently joined Saveur as editor-in-chief, and, as you might expect, he eats very well. This week, “work” for Sachs included a party in his honor at chef George Mendes’s not-yet-open Lupulo (where Daniel Boulud fed him slices of jamón ibérico), and lunches with colleagues at Upland and Charlie Bird. Even at home, Sachs has it good: He cooks on an indoor wood-burning grill, makes an uni-topped English muffin as a snack, and, in general, uses copious amounts of butter. Read all about it in this week’s Grub Street Diet. I’m tiptoeing out the door, early, trying not to wake my sleeping family. I remember to eat something — not because I always (or even usually) remember to eat anything in the morning, but because I remember there’s leftover dessert in the fridge. And I will always remember to eat leftover dessert for breakfast. I’m not a suave breakfaster. I have no ritual, no plan. Mostly, I’m the a.m. cleanup crew, a subsistence scavenger, pridelessly eating stray berries that roll off my daughter’s high chair onto the floor, or finishing the scrambled eggs my son doesn’t want (after he wakes up demanding scrambled eggs). This morning, though, I’m sneaking out to get some work done at Primrose, my local coffee shop in Clinton Hill, when I remember: tarte tatin. Leftover tarte tatin from last night’s date-night dinner at Rôtisserie Georgette. It’s exceptionally good cold. They didn’t put any crème fraîche in the takeout box, so I try slathering it with Greek yogurt. This is pretty good and I should probably stop here, but instead I’m on a slippery slope to finding some vanilla ice cream. Now, without really meaning to, I’m the guy in a tie in the gray silence of morning, standing in my kitchen eating pie and ice cream for breakfast, trying not to wake anyone up. Work on my laptop for a couple hours at Primrose. Nurse a cortado, which here they insist on calling a gibraltar, and which I’m trying not to drink anyway because coffee lately makes me unsettled. Talk nonsense and trade food-nerd gossip and iPhone pictures of our kids with my pal JJ Goode, the cookbook writer and mayor of Primrose. Then it’s time, somehow, for lunch with my colleague, Saveur publisher Kristin Cohen. We’re meeting a client at Upland, which is dangerously close to our office and a current, easy-to-like favorite. We put Justin Smillie’s justly famous short ribs on our January cover. They keep a copy of the issue at the host desk — always very cool to see the magazine out in the wild. Plus, pretty much everything about this place is just sort of engineered to make me happy: creamy shiplap walls, glossy green ceiling, nice lighting, pasta, pizza, the whole Roman & Williams nautical-brasserie vibe. Nobody’s drinking at lunch, which is somewhat disheartening, as I’d hoped to counter the gibraltartado with a little wine. But it’s fine; we’ll survive. We share the beef tartare with anchovy, the burrata with trout roe, and the “five lettuce ‘Caesar.’” Occurs to me that each dish has its own hint of briny, fishy funk. Also occurs to me that I’m good with that. Tonight’s a party for the March issue of Saveur, and something of a coming out for me in my still relatively new gig as editor. At George Mendes’s handsome new spot, Lupulo, which will be opening any day now. You never know what kind of turnout or vibe you’re going to get for this kind of thing, but tonight, the mood is really nice, festive, and happy. Marcus Samuelsson, Tom Colicchio, Marco Canora, Andrew Carmellini, and a bunch of other impressive chefs and friends came in from the cold and partied down. Granted, I was the belle of the ball and buoyed forth upon a steady stream of @Sachsmo cocktails (excellent Portuguese-inflected Manhattans made with madeira and Wild Turkey and named for my goofy social-media handle). Mendes loads me up with briny shigoku oysters with a hit of piripiri sauce. Steal several salt-cod croquettes and bites of cuttlefish terrine from passing waiters. In the manner of a zookeeper throwing fish to sea lions, Daniel Boulud feeds me dangling slices of jamón ibérico by hand. You know, totally regular night. Several rounds of @Sachsmos, followed by not-quite-necessary burgers and fries with the late crew at the Ace Hotel bar, and finally home to bed — but not before killing the pint of ice cream I’d started at breakfast. At 6:45 a.m., the party is officially over. Kids awake early. I feed them something. Drink whatever healthy fluids I can find in the house. Somehow do not fall asleep standing up on C train to office. Saveur is a food magazine, which means we have a test kitchen, which means I am sometimes eating smoked pork knuckle at 11 a.m. and not sure why. The production side of the Saveur test kitchen is all orderly, systematized, professional. What happens to the food after it’s tested and photographed, though, is another thing. We staffers circle the kitchen like feral but well-fed cats, mewling for treats, pouncing on handouts. All my eating today is of the random, drive-by variety: I pick at a platter of choucroute garnie followed by many fluffy biscuits. I ask our associate digital editor Laura Sant, who baked the biscuits, if she’d previously worked at a Popeye’s (the highest biscuit compliment). The themes of the day are sustain, survive, make do with whatever’s around. I love Colu Henry’s term for the dishes you kind of pull out of nowhere: “back pocket pasta.” My version tonight: fresh fettuccine from Rafetto’s (plain egg noodles No. 5, half-inch wide) tossed with a few dollops of La Quercia’s Nduja (the on-trend spreadable sausage that nobody had heard of but now is somehow everywhere), half a bag of frozen peas I’d bought for the kids, and a bit of past-its-sell-by-date heavy cream. And lots of butter. Obviously. For a decade, I lived a couple of blocks away from Raffetto’s on Houston and miss going in there — chatting with the ladies in their white uniforms and aprons, standing in line, watching the big pasta-cutting machine go clunk, clunk, clunk — as much as I miss the pasta itself. Still, I try to keep a few pounds on hand in the freezer for whatever’s-in-the-fridge pasta nights like these, which is quite often. Open a bottle of Pic St Loup, fill a very big glass, drink it in the bathtub reading uppity shelter magazines. Asleep by 10 p.m.
Saturdays alternate between hanging with the kids at home (chaos) and hauling them to tumbling class (organized chaos). While my girlfriend and our daughter are tumbling at the tumblerdome on Atlantic Avenue (one of the many places you don’t ever know about until you have tumbling-aged kids), my son and I hike over to Cafe Pedlar on Court Street. I don’t remember if they have pain au raisin. I will always order that even if I’m not particularly in the mood for one. And I insist on ordering it in a ridiculous, garbled, Inspector Clouseau accent: pan-o-raisaeeeeehhhhn. Pedlar has alluring breakfast pastries: darkly browned, sweet and savory, and stuffed with good-sounding things. Inexplicably, when the moment comes to order, I say, “bran muffin” and regret it immediately. Who the hell orders a bran muffin? I don’t particularly approve of muffins. Tumbling and early mornings have taken a toll. I overcompensate by putting too much sugar in my single macchiato. Lunch is nothing, really. Some light picking around the fridge for leftovers. An apple. I’m in a rush to prep dinner because our friends Devin and Danielle are coming over with their kids and want to eat and be gone by eight (which is usually when I’m telling guests to drink more and fill up on cheese because dinner’s going to be a while). We redesigned our place after buying it a few years back. In the kitchen, I was lucky enough to be able to build in a Grillworks wood-burning grill that I’m more or less obsessed with. Definitely more. Our friends are vegetarians, so no porterhouse on the fire tonight, but I feel like making one anyway. I light some wood and grill a pile of asparagus and a ton of broccoli rabe that I toss with anchovy, garlic, preserved lemon, and red pepper flakes. I also gently grill/pseudo-smoke some little tomatoes that I toss with spaghetti, copious amounts of sea urchin, and butter. Obviously butter. Small ones asleep and friends gone by 8:30 p.m., we open a bottle of decent Champagne and binge-watch five episodes of House of Cards. Sundays are for blueberry pancakes. A couple of months ago, I decided we were a family in need of some meal rituals (other than pulling everything out of the fridge and tossing it with pasta). Somehow, blueberry pancakes seemed right. My son helps stir. They have the feel at least of something slightly good for us. I should say I use a Saveur recipe, but the truth is I stumbled on this one from Smitten Kitchen, with a lot of Greek yogurt, lemon zest, and various flours (I just use what we have, usually plain white), and have stuck with it. More friends with kids stop by, so I double the recipe and supplement it with some smoked salmon, which I picked up at Shelsky’s post-tumbling. Breakfast shades into lunch. I eat all the ugly pancakes. At 4 p.m., other friends drop by (so many people with kids in Brooklyn, it’s like a Russian novel — impossible to keep up with the names). Make Rafetto’s ravioli for the kids. Had some leftover uni, so I improvise an adult snack, stealing an ingeniously simple thing chef Brad Farmerie, who lives in the neighborhood, did for a holiday party: toasted English muffin topped with citrus butter and sea urchin. Dinner at Contra with Spanish cult winemaker Joan Ramon Escoda. Eight courses paired with Escoda’s farmy, funky natural wines. Lots of highlights: beef tartare onto which raw chestnut was microplaned with smoked Cheddar; a deeply flavorful confit of swordfish; thinly sliced veal breast with anchovy and green bits of puntarelle (a riff on vitello tonato); thinly grilled lamb heart with braised and grilled cabbage. Lots of great bread served with Marieke Gouda from Wisconsin and candied hazelnuts. Happy to be invited by my pal Jay Strell. Rare Sunday night out on the town with a fun table of wine geekery, including LCD Soundsystem front man James Murphy and Brooklyn Brewery’s Garrett Oliver. Lunch: again, rootless grazing, found food. Wandered by the test kitchen; made off with a bowl of very good polenta and pork ragu, no questions asked. Dinner: two slices leftover pizza. Bourbon, bath, uppity shelter magazines. Really, Monday, that’s all you’ve got? Breakfast is half a cortado and a plain croissant from WTF coffee in Fort Greene. For lunch, I meet a writer at Charlie Bird. Even on an overcast, blizzardy day, the light’s great at lunch in this narrow sliver of a room. Split a dozen wellfleet oysters, some bay scallops with lemon and bits of crunchy pistachios, and the “veal pastrami salad,” which is frankly more healthy tasting than it sounds. Because you can’t keep up this winter shut-in figure of mine without eating a lot of pasta, I order the spaghetti cacio e pepe and supplement with spoonfuls of hot pepper oil. I used to live down the block on King Street and am happy there’s finally a solid restaurant in the neighborhood. And I’m happy some things never change, like the pleasure of plotting and talking with a good writer and the sign on the deli across the street that notes, boastfully but obscurely, that their bagels are “Freshly Baked at Dawn in an Italian Bakery.” Because, hey, we all want a good story with our food. Back at the office, there’s a tasting of something called “cookie salad” that I’m reluctant to try. It’s inexplicably, mesmerizingly good. My teeth hurt. A friend drops by for a meeting. He brings a batch of his own bottled, barrel-aged Negronis. According to proper meeting etiquette, we drink them. Walk through a snow flurry uptown, late for an early-ish dinner date at the Polo Bar. We drink Manhattans, eat more oysters, chicken Paillard, and Dover sole, follow-up Manhattans, no dessert. It’s no longer early-ish but late now. For reasons having nothing to do with inclement weather and everything to do with nice light and heavy crystal glassware and cocktail stirrers shaped like little polo mallets and being in one of those New York dining rooms that flatters and satisfies all of its occupants, nobody seems willing to call it a night.